SCROLL DOWN FOR MORE SUNRAY PROBES, COILS & ACCESS. 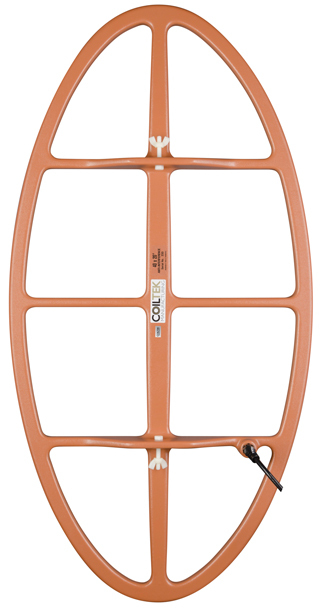 The original series of COILTEK® detector coils offers a coil for every prospector and every terrain, including waterproof models for searching the shoreline, marshes and creek beds. Combining robust manufacture with great performance, they deliver time and time again. 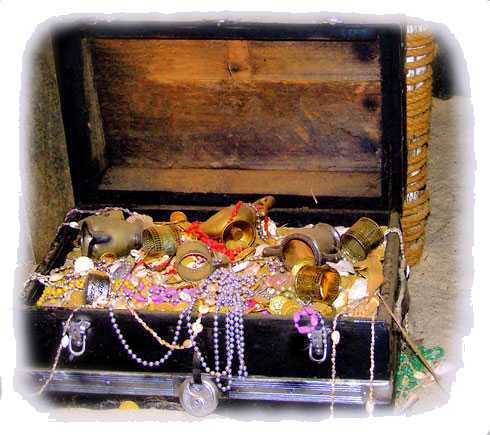 Gold Hunting Coils - Scroll down for details. Pinpoint ProbeThis design for the hand-held pinpoint coil has been extremely effective for quick retrieval of your targets. It is super light and is designed as a locating tool, not a detecting tool due to its small coverage area. 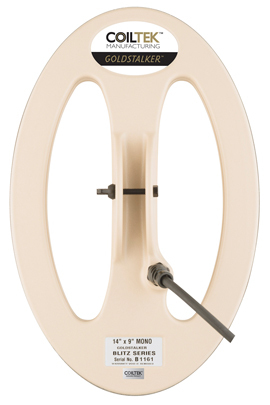 Once the hole is dug, switching to this probe will give you an accurate location for your target. It produces a magnetic field from the end and to the sides so it is quite simple to accurately pinpoint. It can be used in conjunction with our 'Switching Block', which allows you to switch between your detecting coil, to the probe with a flick of a switch without unplugging any coils. As the Probe is a mono coil it is extremely sensitive to targets and can sometimes be ‘Hyper-sensitive’ to knocks and soil conditions. To maximize its stability we suggest you use the Probe at least 1 inch (25mm) off the ground, working very slowly and avoid pushing it through the soil. It will also ‘sound off’ or produce a loud signal if closely surrounded by ground on all sides so avoid pushing this probe into drill holes or similar. 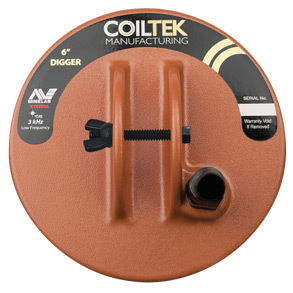 It is best used on soil dug from your targets hole when spread out or searching the edges of a pre dug hole to see if any other small targets are left which the larger coil could have missed. See our coil chart for depth abilities. With the 20” (500mm) long probe, it makes detecting high river banks easy as you can use it like a wand searching the bedrock crevices and similar areas. • Easy to carry – in the backpack or in your pocket until needed. Over the years the VLF platform of detectors has been very successful and the ability of the detectors have benefited from smaller coils in certain conditions. The Minelab Eureka Gold Detectors, along with the earlier models; the XT17000 and XT18000; are now complimented even further with the new release of the COILTEK 6” GOLDSEEKER! This coil is extremely sensitive, and can detect very fine gold and some gold specimens which can be very difficult to locate with Pulse Induction machines! When used in combination with the 60kHz frequency on the Eureka Gold, the 6” Goldseeker coil can improve your chances to find more targets and potentially more GOLD! Being 6” in size allows the coil to have great manoeuvrability through tight terrain and the added benefit of being extremely light weight. It has an easy pinpoint ability which produces sharp, identifiable signals and therefore minimising the time spent locating. It also has good depth for its size so the larger targets down deeper still are heard. By using the 6” GOLDSEEKER you will improve the ability of an already outstanding Detector and ultimately will be Optimising Discovery! The small 10 x 5” (250 x 125mm) coils are most commonly used for mullock heap hunting, areas of heavy over growth hunting and just searching for the finer gold on the patch. With excellent sensitivity and good depth capabilities it is an excellent choice for any detector operator. Their size gives a relatively small view of the ground but it is because of this that they are most suited to the smaller targets. Smaller coil = increased sensitivity to smaller targets. They are also excellent for maneuverability as they are very light weight and can either be used as a detecting coil or locating coil. The small mono has a benefit over most mono coils due to its size. This comes in the way of heightened sensitivity and less susceptibility to mineralisation. Again, the small field being produced reduces the ground noise to some degree however the coil is still a mono coil and this can cause some mineralised conditions to create ground balance issues. Having said that, the target response of this coil is sharp and clear so most likely the targets will be easily heard if within the range of the coils magnetic field. 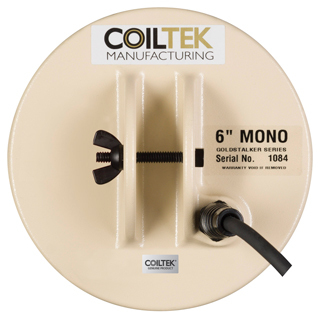 Being a mono it has the windings around the perimeter of the coil so pinpointing can be done by either using the tip of the coil or tilting the coil to vertical and using the outer edge. You will notice that the outer edge is sensitive all around the coil. When swinging this coil you will need to overlap your swings by approximately half the coil length to be thorough and having a slow swing speed will ensure you hear the very tiny targets. Easily carried in a backpack for use as a pinpoint coil. This size is the most commonly used coil for prospecting, mainly due to the new detectors being released with a coil of this size. Many prospectors enjoy using a coil of this size because it gives reasonable ground coverage, has good sensitivity, has average depth capabilities and is relatively light weight. You will find the coil easy to maneuver and it is quite easy to pinpoint with. These coils have been designed to cancel out the effect of external interference. This can come from power lines, electric fences and the spread of the metro area just to name a few. Their performance is very good compared to the similar sized DD coil and we estimate their ability be very similar to the similar sized DD coil. The sensitivity can sometimes match the DD’s and therefore you can be confident when swinging an A.I. that you will have the chance to get the smaller targets and the larger ones. The main sensitive area of these coils is directly down the centre which is similar to the DD. Approximately 1 inch in from the tip of the coil will be the best area for pinpointing and this can help increase your target retrieval time. Their ability in heavy mineralised areas can sometimes become noisy as they tend to behave like a monoloop coil as they struggle with the ground change so having a slow swing will help minimise the noise. The other benefit with this coil configuration is that it will work perfectly well with the Discrimination/Iron Reject settings on the Minelab machines so they add value to your detecting experience no matter where you are. This mono coil has super sensitivity. It is very well balanced and its pinpointing ability is very easily used. When you have located a target you can tilt the coil to one side and use the outer perimeter of the coil to pinpoint. The whole outer perimeter of a mono coil should signal and give an easy pinpointing ability. Again, as the coil can be submersed it can easily see the very small targets trapped in stream and crevices. This coil is best run slightly above the ground as it sometimes can be hyper sensitive due to ground conditions and/or external conditions. With a slower swing speed the coil will have the ability to see the very small targets and quite reasonable depths (this can vary on different detectors and settings used) and still have the chance of responding to a larger deeper target. Remember to overlap the mono coils by at least half if you want to ensure you cover the area well. 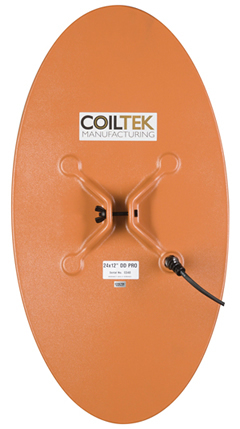 The 14" (350mm) coil is one of the best all-round performing products Coiltek has produced. With a combined advantage of excellent depth and sensitivity it has outstanding performance ability in the majority of goldfields around the world. Being an extremely robust coil it has the capability of lasting many seasons in the field which will make this coil a primary choice when prospecting. The MONO coil has also been one of the most popular coils we have produced as this coil was first introduced to the detecting community when the SD2100’s were released. It has superb sensitivity and depth capabilities and when swung close to the ground and at a slow speed it has the ability to find sub-gram nuggets at depth and also the larger ounce pieces at great depths. 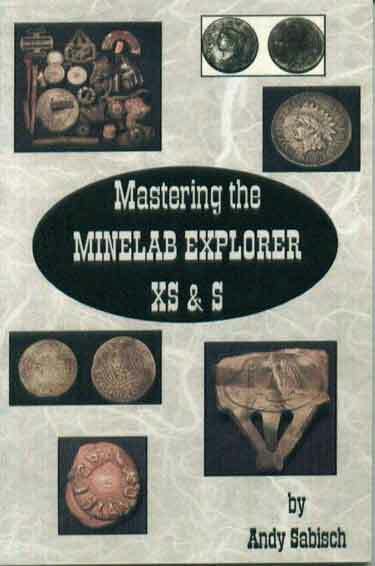 Being a mono coil it is better suited to the low to no mineralization areas for the SD and GP machines however since the introduction of the new GPX series detectors from Minelab these are being used in the high mineralised with great success. Its ability to pinpoint small targets is easy as the outer perimeter of the coil is its main sensitive area so the closer to the coil the target is the response is more to the outside of the coil. If tilted to one side when trying to locate a target in a dig hole pile it will ensure you get an accurate location quickly. Remember to overlap your swings with a MONO by at least half a coil to ensure you do not miss any targets. The AI coil is the best solution for those high interference areas when detecting. When experiencing excessive noise from power lines, phone towers or general atmospheric noise, this coil will run quiet and smooth by cancelling out the interference. This ability opens up new detecting areas and potentially new patches. When swinging this coil, a quarter coil overlap is necessary to cover the ground efficiently and by swinging slowly and close to the ground small targets are easily distinguished from the threshold. The main pinpointing area of this coil is approximately 1 inch in from the front edge and down the centre of the coil and will give a strong signal when close to the surface. This coils’ ability is best seen firsthand so if you get a chance to try an AI coil you will notice that its performance is very compared to the DD coil of similar size. These are also used on the SALT LAKES of Australia with outstanding results! 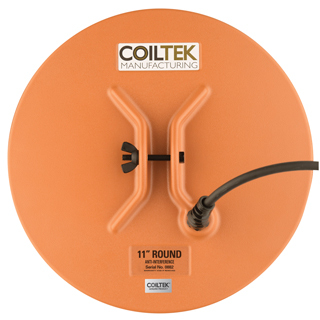 The 14” (350mm) coil is one of the best all-round performing products Coiltek has produced. With a combined advantage of excellent depth and sensitivity it has outstanding performance ability in the majority of goldfields around the world. Being an extremely robust coil it has the capability of lasting many seasons in the field which will make this coil a primary choice when prospecting. 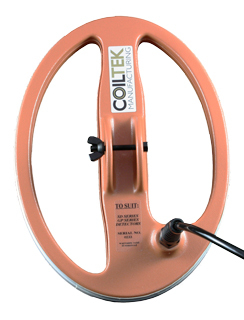 The 15” Goldseeker WOT MkII coil is a very successful coil for the Eureka Gold and XT Series Detectors made by Minelab. Due to the size of this coil, it can increase the depth performance up to 30% over the standard coil without reducing the sensitivity a great deal so its response to smaller targets is very good. Being a larger coil, pinpointing can take some getting used to but it will not take long to get used to the coil’s sweet-spot and enjoy its overall performance. This size of coil is best suited to open terrain hunting or in areas where there are old diggings. Working slow and low is best. Again, due to its size, it does need to have time to respond to targets at depth accurately and handle the ground conditions. This coil works well in the 6.4kHz and 20kHz settings as these compliment the larger coil’s performance and provide deeper seeking. The coil is FULLY WATER-PROOF. It has been finished off in a gloss-black epoxy resin which seals the coil windings inside and provides its water proof characteristic and its robustness. The housings are made from injection moulded ABS plastic which can certainly endure extreme environmental conditions. NOTE: Coil is supplied with a fitted skid plate. 24x12" EllipticalFor prospectors who don't mind digging deep holes! Good depth capabilities plus sensitivity to find sub-gram targets close to the surface. Covering a lot of ground quickly, it offers excellent manoeuvrability through overgrown areas and between large rocks, as well as being waterproof (mono only). The narrow shape allows for easy pinpointing with the sweet spot being about 3cm from the tip. These coils were originally produced for the SALT LAKES in Western Australia but have become a great search tool for many areas around the world. They have excellent depth capabilities which is why they are such good patch finders but their sensitivity to smaller targets, 1-2 grams and below, is greatly reduced. For a 1-2 gram piece to be heard it would need to be on the surface and the coil detecting speed quite slow. However, finding the small pieces is not what this coil is designed for! The 40 x 20 coils do take a little time to set-up and get right in regards to towing / dragging but their performance is very good once achieved. The main thing to remember is to protect the cable from any snags or pulls from low lying bushes and rocks. Clear, flat terrain is best. The coil can be around 1-2inches off the ground depending on what you make the coil housing out of and remembering that the coil needs to remain connected to the housing to prevent the bumps of normal travel dislodging the unit. This can be achieved by cable ties or nylon nuts and bolts. The coil housing is best made from timber as is the arm which connects the unit to the quad bike. The skids for these coils can be made from tough, durable plastic or conveyer belt material. Just remember that some material can have wire re-enforcing inside it so if you’re unsure, just wave the material to be used over the detector coil first to see if it ‘sees’ the material. If you are dragging this coil by quad bike we recommend your speed to be about 5-7kms/hr which is like walking pace or idle engaged with 1st gear and obviously picking a relatively clear path. The Coil needs to be around 3 metres away from the bike. This will provide quieter operation. If you are dragging the coil behind a person or using a trolley set-up then this the same speed applies, just be prepared for some hard work! When setting this unit up on the skid you must ensure this area is protected from anything which can pull or damage the cable. By cable tying the cord down after it comes out of the coil, ensuring the cable is not at a very tight angle to the exit point, you will prevent any damage in this area. Remember A.I. coils can get a little noisy due to ground conditions so the slower the better. We hear of people using little flags or coloured spray to mark targets heard when on a run to minimize the times they get on and off the bike. Having a handheld unit close will help you identify the target quickly and if you work with a partner then one can patch find and the other can retrieve the signals heard. This is the coil of choice when hunting the Salt Lakes or dragging the coil behind a quad bike and you want to cover lots of ground quicker than a hand-held set-up. It has good sensitivity and has the ability of punching deep into the ground. This coil is not the tool to use when pinpointing so a smaller handheld coil would be recommended for this. As these coils are fully epoxy filled (potted) they are very robust and rigid so can take some hard work however the cable entry point on the coil is the most precious part. They have a similar coverage area as a DD so a ¼ overlap is recommended and a slow travel speed is best. Running the coil in standard DD settings on the later model detectors will ensure the coil performs as it should. Remember the most responsive area of the coil is the centre spine so with experience you will be able to master this coils ability. If you require further information on your set up or use of this coil you are welcome to contact us to discuss it further. The 17 x 11” Elliptical coil has and is proving to be a fantastic all round performing coil. 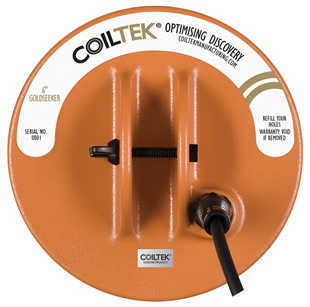 Released to provide a well balanced coil which provides the prospector with good maneuverability in tight areas it continues to be a preferred coil of use for a lot of operators. With its elliptical shape it provides good coverage over the ground and the ability to search in and around the terrain and is also complemented in having excellent depth and sensitivity capabilities. When nugget hunting it can pick up the sub gram pieces and ensure that pinpointing is made easy with the tip of the coil. It has a centre mount shaft mounting position with an 8mm nylon nut and bolt for extra strength. Also, being of the solid coil design it can help when grasses are long to push down close to the ground and not be hindered by sticks and the like stopping the swing. This coil is a great choice for excellent overall performance and balance and continues to find gold in many of the world’s gold prospecting regions. With its excellent detecting capabilities you will find that this coil will ensure you have a great chance in the field as it will search deep as well as seeing the smaller sub gram targets quite easily. By keeping the coil close to the ground (no more that 1 inch above) you will find that the 0.1 gram nuggets can be heard at a couple of inches which is proving that the coil has good sensitivity. When pinpointing, slowly work up to the target and listen for the first response heard. Usually this is within the first inch in from the tip of the coil. Then repeat the process at 90 degrees from the first direction. Once you have a crosshair view of the location it becomes a lot easier to accurately dig for the target. The DD PRO allows the operator to have quiet operation in the heavier mineralised areas ensuring faint target responses are heard. Needing only to overlap the coil by one third, this coil can cover the ground quickly due to its elliptical shape making this a great choice for the more open areas in the detecting field. This is a good medium-sized patch hunting coil. To say that the AI coils are sleepers is a huge understatement. We have heard that these coils are proving to be a coil of choice in a lot of areas around the world as detecting areas become more susceptible to external interference. This interference comes from Electrical towers, mobile phone towers, electrical storms and other detectors. It is also prevalent around built up areas which are close to detecting sites. It will allow the operator to run with a smooth threshold when a DD or MONO coil is extremely noisy. Its performance ability is only just behind that of a DD PRO however it can sometimes become slightly noisy when the mineralsiation content increases. These coils are best run on the more mild ground but perform excellently when encountering external noise. These coils were designed for the SALT LAKES of Western Australia but continue to prove their ability in many fields around the world. These coils do not need to run in cancel mode on the newer detectors as the coil is doing the work of cutting out the interference. These are best run in DD mode and will also work well with the discrimination function. Sensitivity is excellent and depth is very good so this coil is a good choice for many hunting areas. Coiltek Goldstalker coil finds gold for me the first time out. 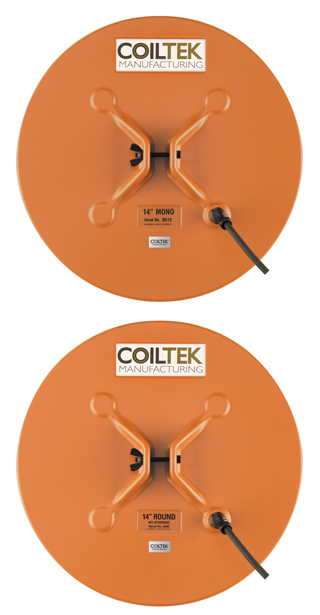 Introducing the new GOLDSTALKER® series of lightweight coils by Coiltek Manufacturing. The GOLDSTALKER® series has been designed with the prospector in mind. Delivering superior performance and characteristics these coils are leading the way in after market coil innovation to provide an excellent choice for your hunting tools. Suited to the SD, GP and particularly the GPX detectors, the GOLDSTALKER® series provide the user with maximum depth capabilities and superb sensitivity. Sniffs out the smaller nuggets the bigger coils miss. 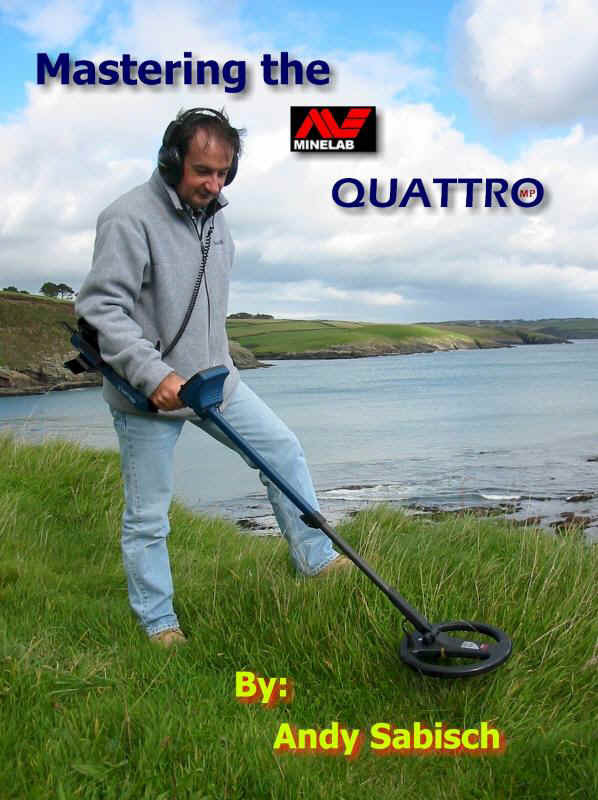 NOTE: The GOLDSTALKER® Series will work well on all Minelab SD, GP & GPX machines. Full 2 year warranty from date of purchase. 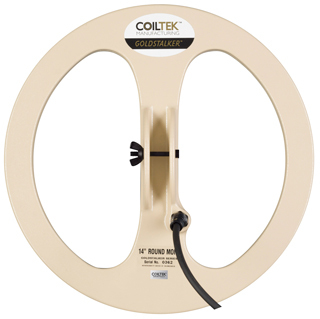 Designed to work on all SD/GP & GPX detectors this coil is the next in the GOLDSTALKER® SERIES. Designed to work superbly on the mullock heaps and shallow ground where the larger coils have been but might have missed the small targets. A great finisher! 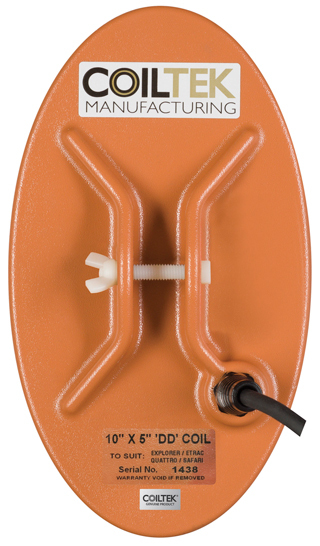 Designed to work on all SD/GP and GPX detectors these coils are the next in the GOLDSTALKER® SERIES. 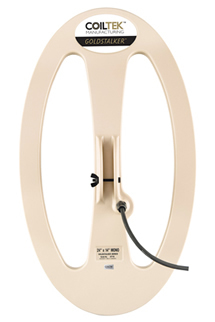 22" Round GoldstalkerThe newest additions to the GOLDSTALKER® series take superior performance and ramp it up even more. Offering excellent search capabilities over large open areas, these coils not only see more ground with each swing, they give maximum depth penetration to find the lodes the others miss. Weighing in at only 1110g, this large coil is very lightweight for its size and makes light work of searching large areas. 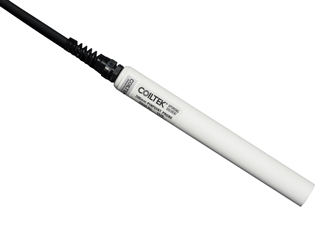 It offers a good stable threshold in most circumstances plus the best depth capabilities of the round coils. Although suited to larger, deeper targets, it still impresses with its sensitivity; during testing it found 2g pieces at approx 25cm deep. 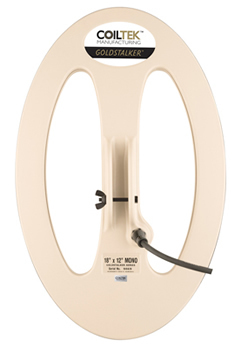 The largest of our 24 x 14" elliptical coil features a new, broader shape. This increase in width compared with the standard 24”x12” adds to the coil’s depth capabilities and gives better overall performance. As with all the elliptical coils, the narrow ends provide good pinpointing ability and manoeuvrability through more dense terrain. Great as a patch finder or a general search coil, it also picks up smaller targets closer to the surface. Lightweight for swinging all day, it’s perfect for searching for a good cross section of targets. Specifically wound for the new GPX5000 detector this coil, coupled with the 'Fine Gold' setting, has the potential to brighten up those faint targets, especially the smaller pieces at depths only seen on the new GPX5000. 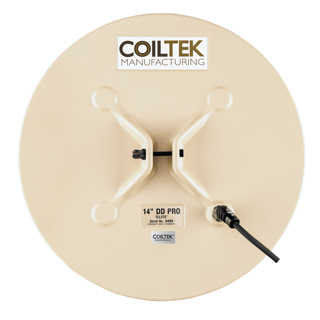 The coils ability utilizes the already popular shape and size of the 14x9" coil providing excellent manoeuvrability and sensitivity for pinpointing and depth. Our Coin and Relic series has been specially designed to enhance the performance of coin and relic machines operating in diverse terrains around the world. 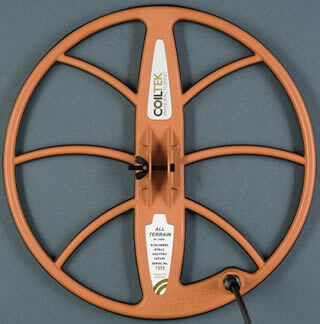 Whether you are detecting fields, parks beaches or streams we have a coil for you. This range includes fully waterproof coils to provide more options and enhance your prospecting experience. We are the only global after market manufacturer of fully approved Minelab X-TERRA coils utilising the VFLEX technology. This fully waterproof coil has excellent depth capabilities, pinpointing easily with the tip of the coil or using the pinpoint function on the detector. The 15" X-TERRA has a new design and is available in all 3 frequencies – punching deep into the ground and giving great overall performance no matter what the terrain. For coil to X-TERRA detector compatibility please see the chart below. 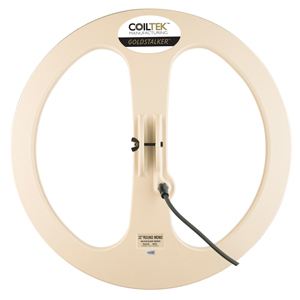 15" X-TERRA coil 18.75kHz* is your choice for sensitivity and great gold hunting. 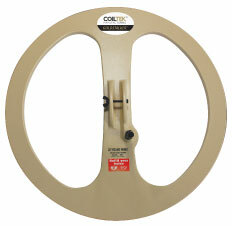 15" 7.5 kHz medium frequency coil is compatible with all Minelab X-TERRA detectors. 10x5" Elliptical Joey CoilThis coil has utilised the success of the 10x5” coil for the Gold hunting machines and applied similar results to the coin and relic hunting units. The size and shape of this coil makes it an excellent option for any dry-land terrain whether at the parks or playgrounds or old townships to dry sand at the beaches. It has excellent maneuverability for tight areas and it is ultra light weight. The coil is WATER-RESISTANT so it is not recommended to submerge or use the coil in very wet situations. 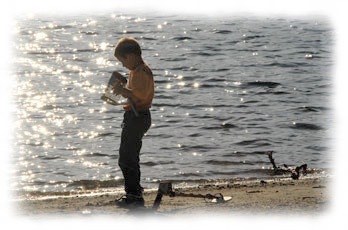 Water can void your warranty if it is the result of any damage or performance loss. The housing is made from strong ABS plastics, which ensures the coils durability. When working with this small coil, remember to swing slowly as sometimes these smaller coils make the operators swing faster to cover the ground, but this acts against the coils abilities. Also remember to keep the coil close to the ground as being small it doesn’t have the penetration like its larger counterparts. .See the coil specs chart for more information on this product. The 6" X-TERRA utilises the Minelab VFLEX technology and is the perfect choice for trashy areas, giving excellent target separation and stability. Easy to swing and manoeuvre through tight areas, it also performs well in different soil conditions. Operating at 3kHz, the Digger allows the user to hear targets of certain metals more clearly than the 7.5kHz and 18.75kHz frequencies – which means better opportunities for more rewarding targets. This coil has been an excellent addition to the range of products we offer. This is a unique design as it is fully water proof and one of only a few fully water proof coils we produce. The coil is potted with epoxy resin which holds all the windings secure and provide its water proof ability. The coil comes with a fitted skid-plate which has been designed so it can be easily removed to clean out trapped dirt or dust or to remove completely and swing without the skid. The coils robustness will ensure that if run without a skid plate it will endure the knocks and bumps during normal swing action. 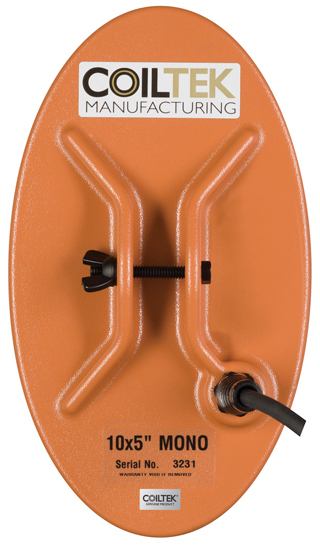 (solid skid plate also available) Remember that only the coil is water proof, so ensure that your cable plug and control box are kept free of moisture at all times. The Platypus has been very well received for the hunters who detect on the beach or around streams and creeks. Due to the elliptical shape it has been an excellent coil for pinpointing targets. Swinging with an overlapping sweep pattern is crucial to make sure the ground is covered well. When you have a target then slowly swing up to it from 2 different angles and when you start to hear the target it usually is 1 inch in from the nose of the coil. The Platypus excels in areas of high trash and targets stand out with its excellent sensitivity, great pinpointing ability and good target separation. The 15” All Terrain WOT coil is a very successful coil for a wide variety of detectors. 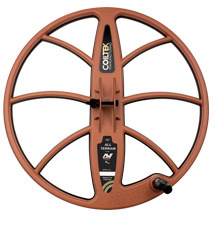 Whether you are hunting for coins, relics or treasures and are wanting it for a Minelab Sovereign series detector through to their Excalibur, Explorer, Etrac and more, or you are hunting for gold and you want this coil for a Minelab XT series detector or their Eureka Gold, this coil covers them all. Due to the size of this coil, it can increase the depth performance up to 30% over the standard coil without reducing the sensitivity a great deal. Of course there is always some trade off but its response to smaller targets is very good. Being a larger coil, pinpointing can take some getting used to but it will not take long to get used to the coil’s sweet-spot and enjoy its overall performance. This coil is very popular with the Coin & Relic hunters around the world and it has earned the nick-name ‘WOT’ which stands for ‘Wild Orange Thing’ due to the terracotta colour and performance. 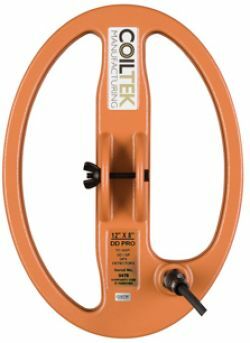 See below for 15” WOT coil to Minelab detector compatibility. * Covers all aspects of how to get the most out of the new Explorer series in the field under a wide range of conditions. * Each chapter provides detailed explanations of the features, how to best adjust them and how to find more in less time - even in hunted-out areas! * This book is designed for Explorer owners as well as those that are still "kicking the tires" and want to learn more about what the Explorer offers. Full-Band Spectrum technology explained - the secret behind the Quattro MP. Features and specs of the Quattro. Air testing & test gardens. Chapters on coin, relic, beach and competition hunting with the Quattro! If you didn't know about the Quattro before you will after reading this book! * Makes changing coils on your water detector a snap! * Some knowledge of soldering and wiring required. * Recommended for shallow water hunting. Not recommended for deep diving situations. We do not offer detailed installation instructions and results may vary. We do not guarantee results. 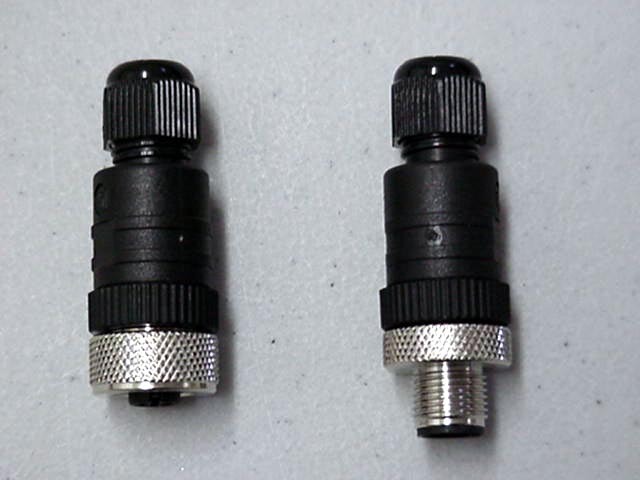 We do guarantee the connectors to be free of defects. You should contact your detector/coil manufacturer for wire pin ID, etc. before attempting installation. NOTE: NOT RECOMMENDED FOR DETECTORS WHICH ARE UNDER WARRANTY!! YOUR WARRANTY COULD BE VOIDED! !